Many have wondered what the career of Hank Williams might have looked like if he’d lived past 29. Would he have given into the trends of the burgeoning country music industry and eventually become part of the Countrypolitan sound? Would he have stuck to his guns and become a surly old performer refusing to change with the times and trying to hold onto his past glory until he was eventually forgotten by time? Would Hank Williams be regarded as highly as he is today if he hadn’t died such a tragic and poetic rock star death before the world even knew what a rock star death was? We’ll never know for sure, but one living legend of country music might provide at least a little insight into the question. It’s probably fair to officially begin referring to Wayne “The Train” Hancock as a country music legend. Maybe he’s still a little young for the model definition of a “legend” to fit, and maybe he never reached the tops of charts like Hank Williams and many of the others we consider country legends did. But very few, including many legends, can claim bringing a signature sound to country so unique that it launched its own subgenre, inspired countless new artists in an entire neotraditional movement, and few find such artistic respect from such a wide range of musical peers as Wayne Hancock, even if it all occurred in a microcosmic sampling compared to the reach of the mainstream. Many consider Wayne Hancock as one of the closest things we have to Hank Williams in modern music today, but if that’s the case, he would be the post 29-year-old Hank Williams that never compromised, and perhaps paid a price in popularity and financial prudence for it. From the mid 90’s to the mid 00’s, especially when Hank Williams III was running all over the country singing Wayne Hancock covers, there was nobody hotter in the hip neotraditional circles. And during this time Wayne seemed a little bit more open to shaking up his style just a little bit. When the swing craze hit, he emphasized that part of his signature “juke joint swing” style. 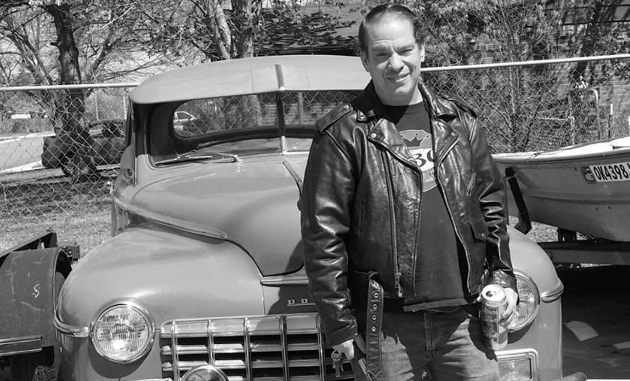 Other times he veered into what some would consider a more rockabilly style. But these days you know what you’re going to get from a Wayne Hancock show or album, and you know it’s always going to be good. Wayne Hancock’s life for what now seems like an extended period has been kind of one hapless situation after another. In 2009 he released the album Viper of Melody, with one of the big selling points being that the same personnel you see on the road is the same that you got on the record. The problem was, his steel and lead guitar player got in a brawl right as the album was being released, and the band was blown up. In 2013 Wayne released the record Ride with a motorcycle on the front and the title track singing the virtues of hitting the open road on two wheels. Not long after Wayne ended up in the hospital with broken bones and a collapsed lung after a bad accident on his bike. There was a rehab stint thrown in there, and a divorce. But “The Train” rolls on as they say, and Hancock doesn’t miss a beat, touring regularly and trying to hold together a band. Isn’t Wayne Hancock’s story similar to the rest of us. We have a plan, and then life happens. Hank Williams, and many of those old legends of country music had it the same way, and that’s what country music is there for—to “swing” you though those hard times as Wayne Hancock would say. His latest record Slingin’ Rhythm finds him in sort of a surly mood, but one that comes from an honesty about his state of affairs. The title track is upbeat and boisterous, but also seems to slightly bemoan the endless pattern of constant touring and coming off the road that Hancock finds himself trapped in to keep the bills paid. The “Dirty House Blues” sounds taken right out of his true life situation, with no one to help him around the house and constantly leaving, he looks forward to hotel rooms where someone else can clean up after him. “Killed Them Both” is about as vengeful as you’ll ever hear Hancock get, and he includes the old Merle Travis tune “Divorce Me C.O.D.” if you’re wondering about Wayne’s current perspective on love. Even the song “Two String Boogie” about running out of good wires on the guitar seems to speak to a downtrodden state of affairs surrounding the “King of Juke Joint Swing” these days. One of the few moments that feels lighthearted on the record is the quick instrumental “Over Easy.” Produced by Lloyd Maines, Slingin’ Rhythm is definitely set to the Texas swing traditions of a bouncy rhythm and the pedal-less steel that gave the country music of Texas its own signature flavor in the 30’s and 40’s, even before folks like Hank Williams were making their mark. Then by adding a little bit of that later 50’s influence, Wayne Hancock makes his trademark take on country music something both familiar and uniquely his own. 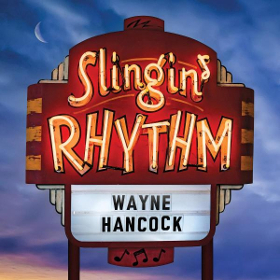 And isn’t it appropriate that Slingin’ Rhythm ends with Wayne covering Hank’s “Thy Burdens Are Greater Than Mine,” which illustrates with great wisdom that the problems we all face can pale in comparison when you behold the truly downtrodden and destitute. By ending the record on this note, Wayne Hancock encapsulates a greater lesson in the music that he sets up with all the bellyaching before. Neotraditionalism has given way to plain old traditionalism as a trend in country music, Hank Williams III is nowhere to be found, and many of those fans from the 90’s and early 00’s now have kids and mortgages and can’t make it out to every show. But “The Train” rolls on just like he has for over 20 years now, with dues paid and skins tacked on the walls, and a legendary status now more earned than in the offing. A “good” album has an overarching theme, that 7 or eight out of ten tracks fit into, with maybe one at the beginning or end (or right in the middle) that deviates from the theme for a bit of fun. Most people don’t get it, and an album is just a collection of songs to be shuffled through in any order, and the listening value drops. sure, a couple tunes deviate from the theme, but it all fits together, and the choice of a final song really marks the album as a sort of abstract musical novel, with a story and some closure. Does every album have to be a “concept” album? No, but it would be nice if more artists saw an album as a work of art rather than just bunch of unrelated songs all tacked together. and Hancock has always tried to make each album unique, with a different bent on each set of material. Today a Country Star just does the same music he did last album but changes the words a bit. the production and themes are all the same. Hancock adjusts the production, and covers varying themes on each album. and it makes each album unique and a fresh listeninng experience even if you’ve heard an album of his before. Just listened to it. Very good album overall. A little bit boring, but I think that’s the way a proper traditional album is. Very nice guitar playing too. Is that him on guitar? Love it! Nice to see they got a female Steel guitar player! There are some band in sweden who plays this older music…But most of them are of course only playing for fun since you cant make a living from playing this kind of music in Sweden…Here is example, they called themself “The Western Toneflyers”, but I don’t think they exist anymore. But new band will be formed… I don’t think this kind of music will ever die. Wayne is like Don Kelley in that he so clearly respects good musicians and lets them stretch out. He’s also a damn good writer. And did you notice his band has no drummer? That’s because Wayne slams out rhythm like a machine. This guy is a frickin hero. Keep rolling Wayne! Well said Trigger, and great comments everyone. My Texas buddies kept telling me about Wayne and I watched a video of him doing his classic “Thunderstorms and Neon Signs” and I was hooked. It was just him, a Tele guy and an upright bass. Wow.